As you may recall, I recently said some nice things about recent developments at OverDrive. Unfortunately, I have nothing nice to say about their most recent developments. The news has had the biblioblogosphere buzzing (e.g., Library Journal, Jessamyn West at librarian.net, Sarah Houghton-Jan at Librarian in Black): OverDrive has announced that they will be changing their ebook lending policies to allow publishers to limit the number of times an item can be “borrowed.” More specifically, each title published by HarperCollins will expire from the library’s collection once it has been used 26 times. Naturally, this is in addition to the restriction that only one person can have an ebook “checked out” at a time (what OverDrive calls the “one-copy / one-user model”). Now, for those of us who work with technology, the one-copy / one-user model is frustrating; it’s a way of artificially reducing the usefulness of electronic content. But the fact is, this model makes ebook lending more like the lending of physical books, so it’s not completely outrageous. On the other hand, limiting the number of uses is not related to traditional lending. Although it’s true that books wear out eventually, I would question the binding quality of any book that was damaged beyond repair after 26 instances of normal use. I understand that it would be unfair for a consortium of libraries to pay for a book once and then allow all of their clients to simultaneously download it and keep it forever, and that’s why we have the one-copy / one-user model and digital files that become inoperable after a designated loan period. Limiting the total number of downloads makes OverDrive much less attractive to libraries, and I would expect that some libraries who have been considering subscribing to OverDrive will decide against it after hearing this news. As an academic business librarian, HarperCollins simply doesn’t affect my part of the world too much. I’ve been writing nice things about OverDrive lately. I’m concerned that OverDrive may be opening the floodgates for other publishers to further restrict library use of their electronic content. I should point out that the OverDrive announcement also included other bad news that I expect would be more relevant for public libraries; read the Librarian in Black article for more details. The ebook industry is still relatively new, so it’s normal for it to be experiencing growing pains. As the popularity of Kindles and Sony Readers has increased, so has ebook piracy, and publishers have every right to be concerned, both for themselves and for their authors. In the early days, most publishers avoided letting libraries lend electronic materials at all, so OverDrive itself was a major step forward, and librarians have hoped that openness and usefulness would continue to improve. By offering compatibility with more devices and improving ease of use, OverDrive took another step forward. By limiting the number of times an item can be used, OverDrive is taking many steps back. Update: for extra credit, take a look at the ebook user’s bill of rights over at in forming thoughts. 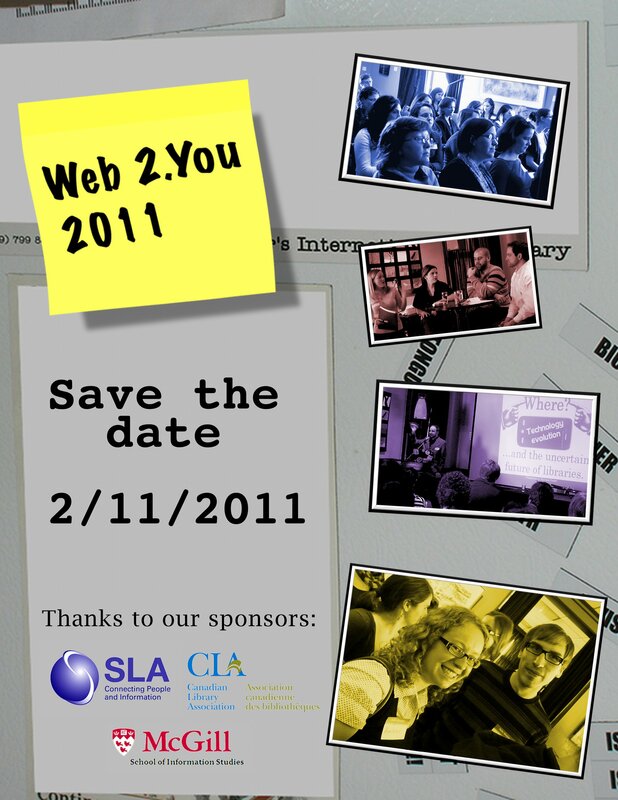 As I mentioned in my last post, Ulla de Stricker was in Montreal on Friday for Web 2.You. At the suggestion of Cabot Yu from CLA-CASLIS, the CLA McGill Student Chapter (led by Adam Baron) and the CLA Montreal Chapter (led by yours truly) were lucky enough to be able to host Ulla for a career planning workshop on Saturday. Although the audience was composed mainly of students, I certainly learned a lot, and I believe the other professionals did as well. In case you don’t know, Ulla de Stricker is the President of de Stricker Associates, but before becoming a consultant in 1992, she worked in a variety of information-related roles. The breadth of her experience was apparent throughout the workshop, and she emphasized the value of having twenty years of experience as opposed to having one year of experience twenty times over. She said that if we only took away one piece of advice from the session, it should be to become active in professional associations. This is one of the things I keep saying to students, so I guess this means I’m on the right track in my advice-giving! She told the very sad story of a woman who lost her job after many years and struggled to find a new one because she hadn’t been active with any associations. The meat of the content included how to create a resume/CV that’s attractive in terms of content and layout (don’t focus on job descriptions, tell your potential employer what you accomplished and took away from previous positions), how to appear and behave at job interviews (bring a nice pair of shoes in a bag if the weather is bad), and how to market yourself and make your work visible (identify your most important clients and do everything you can to learn about their needs and market your services to them). The slides are available online, so I won’t rehash the entire presentation. I just want to urge everyone, students and professionals alike, to take every opportunity to learn from respected experts like Ulla de Stricker. Until her next presentation, I suggest you look through her slides and consider checking out the book she just wrote with Jill Hurst-Wahl as soon as it’s available.